We are a local market garden that provides food and occasional plants grown in an urban environment. 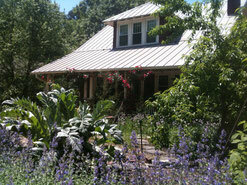 Elam Gardens focuses on herbs and kitchen garden plants. We are very much committed to providing products and services to help grow a resilient, attractive, and bountiful local community. Customers can find us every Saturday at The Corner Farmer's Market from 8am to 12 noon. Elam Gardens is located in Greensboro North Carolina, USA. It is the home and business of Stephen Johnson and Marnie Thompson.